Access Israel Annual International Conference on "Innovation and the future of Accessibility"
We are in an era in which the pace of changes, developments and innovations is constantly advancing and touches every aspect of our lives. More and more products and services which connect companies and service providers to their customers are becoming more digital. With all this progress, it is important that we know to expect, understand and analyze the fore coming changes each one in its field of expertize in order to make sure that during this progress we are not leaving behind people with disabilities and the elderly who comprise of almost 30% of the population. We need to make sure that our future will be accessible day one – from the planning stage so that people with disabilities and the elderly will be an accessible and a usable one. 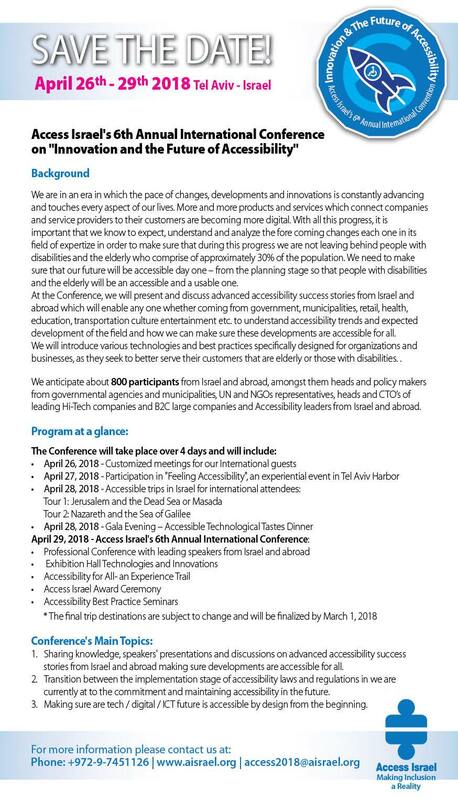 At the Conference we will present and discuss advanced accessibility success stories from Israel and abroad which will enable any participant, whether coming from the government, municipalities, retail, health, education, transportation culture entertainment etc. to understand accessibility trends and expected development in the field and how we can make sure these developments are accessible for all. We will introduce various innovative technologies focused on accessibility, specifically designed for organizations and business, as they seek to better serve their customers that are elderly or those with disabilities. We anticipate 800 participants from Israel and abroad, amongst them heads and policy makers from governmental agencies and municipalities, heads and CTO’s of leading Hi-Tech companies and B2C large companies and Accessibility’s leaders and professionals from Israel and abroad. Sharing knowledge, speaker's presentations and discussions on advanced accessibility success stories from Israel and abroad making sure developments are accessible for all. Transition between the implementation stage of accessibility laws and regulations in we are currently at to the commitment and maintaining accessibility in the future. Making sure are tech / digital / ICT future is accessible by design from the beginning.